Millennia ago, before rabbis existed or conversion was invented, thousands who were not born Jewish became part of the Jewish community through a very simple act: They married a Jew. Centuries later, at a time when the number of American Jews marrying non-Jews has reached an all-time high — 80 percent of Reform-raised Jews who married in 2000-2013 married non-Jews — thousands are again choosing to join the Jewish people, but nowhere near as many as we would like. Unbeknownst to even keen observers of Jewish life, about half of those who identify as Jews but were not born Jewish never underwent formal rabbinic conversion. The 2013 Pew survey of American Jews found 79,000 adult Jewish converts, but another 83,000 who identify as Jews even though they reported no Jewish parents and had not undergone conversion. How did they become Jewish? Many married Jews. Others have Jewish grandparents or more distant Jewish ancestry and are reclaiming their roots. Some do call themselves fully Jewish, but many say they are “partially Jewish,” a newly burgeoning group first documented in the Jewish Community Study of New York: 2011. This seemingly novel phenomenon of joining the Jewish people without rabbinic formalities should not be surprising. In today’s America, more and more social identities are personally chosen and socially constructed. Religious identities have become among the most fluid, with more intermarriage and more people changing their religious identities than ever before. Even more significant may be those who marry Jews who think of themselves not as Jewish but as “fellow travelers,” like the biblical category of “ger toshav,” or “resident supporter.” Some become part of our community because they sense an opportunity to feel part of something important and meaningful. And they often do this despite the fact that we don’t exactly put out the welcome mat for them. We know that where both parents identify as Jews, nearly all their children identify as Jews as well. And when only one parent sees himself/herself as Jewish, only a minority of their children grow up as Jews. Aside from raising the inmarriage rate, how can we create more households where both partners see themselves as part of the Jewish people? In other words, born Jews would undergo a subtle but critical shift in the way they relate to family members and friends not born Jewish. It would mean fully including them in holiday practices, life-cycle ceremonies, and Jewishly centered social action and political activities. It would mean concretizing (if not promoting) the social reality that rabbinic conversion is not the only way to join the Jewish people or function Jewishly in a Jewish family. It would also mean that more intermarried couples would come to see themselves — and be seen by others — as inmarried. The widespread presumption of Jewish-by-marriage will set many couples on upward Jewish journeys. Most critically, their children will see themselves far more often as Jewish, if for no other reason than both their parents see themselves as members of the Jewish people. This is going to take some work. We have overdeveloped muscles of defense when it comes to who’s in and who’s out. These muscles have been strengthened by anti-Semitism, to be sure. For much of the 20th century, as the Jewish community in America both acculturated and tried to maintain deep connections to Jewish tradition and culture, there was an ongoing struggle about how and if it was possible to engage fully in American life and still preserve high inmarriage rates. Jews today are facing an unprecedented opportunity to share our rich tradition with thousands who are searching for meaning and looking to raise healthy and happy children with a deep connection to community. Certainly, some who marry us will decide to officially “join” the Jewish people through rabbinic conversion. Our arms should be wide open and encouraging to those on this path. Conversion classes and experiences need to be excellent, accessible and, frankly, more affordable in order to attract larger numbers. Our community needs to set this as a priority. But for those who choose to be part of our community without formal conversion — who come to the Passover seder and drive their children to Hebrew school, who sit shiva with us, or who bring their sons into the community at a brit milah, who shep naches at their daughters’ bat mitzvah and who go to Israel on vacation — we say welcome. It’s a pleasure to know you. Come learn. You’re one of us if you want to be. Op-Ed by Steven M. Cohen, a research professor at Hebrew Union College-Jewish Institute of Religion and director of the Berman Jewish Policy Archive, and Rabbi Joy Levitt is the executive director of the JCC Manhattan. 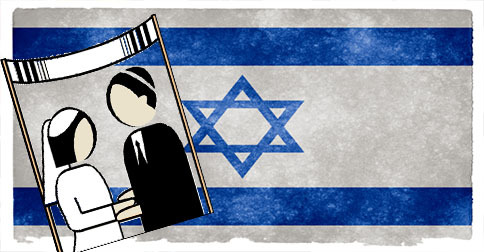 Según tomado de, http://www.virtualjerusalem.com/news.php?Itemid=16511 el martes, 7 de abril de 2015.